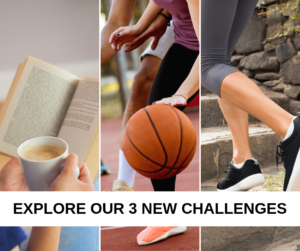 Now available for client deployment are three new challenges designed to improve the mind and body. Challenges include rich content, multiple configuration options, and a comprehensive package of marketing and communication materials to support your wellness campaigns. During this 8-week challenge, participants shoot for higher fitness. Stretching, aerobic, and strengthening activities work together to provide a well-rounded workout. The more active participants are, the more baskets they score. This 2-week challenge encourages participants to increase their physical activity by skipping the elevator and taking the stairs for greater stamina and strength. This 2-week challenge invites participants to read more in-depth material in any format (print, audio, electronic) for fun, relaxation, and new insights. © 2018 PDHI. All rights reserved.